Dr. Donald J. Balch passed away peacefully at the University of Vermont Medical Center on May 13. He was born in Hanover, N.H. on July 15, 1922. He was the son of Ralph and Mareta Balch. He grew up on a small dairy farm in Lyme, N.H. and graduated from Hanover High School. He was attending the University of New Hampshire when, at age 20, he enlisted in the U.S. Army. Donald served with the 121st Calvary reconnaissance squadron as corporal and section leader. He was in combat during the Battle of the Bulge and through Germany, and was among the first to liberate the concentration camp at Dachau. Donald was awarded 4 battle stars, the Victory Medal and the French Fouragere. He had met Mary Sawyer just prior to leaving for the service. After his discharge, they reconnected and were married on Easter Sunday, 1946. Donald returned to U.N.H. on the G.I. bill and completed his Bachelor and Master degrees. He worked for 2 years as assistant herdsman at Hycrest Farm in Massachusetts. It was the largest purebred Brown Swiss herd in the country. In 1952 he accepted a position at the University of Vermont and settled his family in Underhill. He taught animal science courses, was Extension Livestock specialist for the State of Vermont and directed the Morgan Horse Farm breeding program. In 1962 he completed his PhD. in animal genetics. 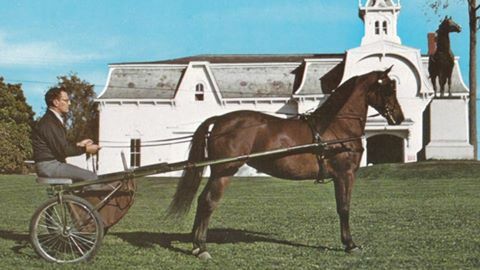 Now his work became more focused on developing the Morgan Horse program and farm. Donald loved the farm and the beautiful horses and through his dedication the farm and program evolved from a state of near extinction to a National Historic Site and a source of pride for Vermont. Dr. Balch succeeded in producing outstanding championship quality horses, began the Volunteer Apprentice Program, and did much fundraising to help make the farm self-sufficient. In 1964 he was named "Man of the Year" by the American Morgan Horse Association. Don was a respected show judge and author of many articles. In 1988 he was inducted into the American Morgan Horse Association in Los Angeles. Donald officially retired from UVM in 1985. He was honored again in 2000 by a special dinner in Northampton, MA. An auction was held which raised considerable funds to "kick start" the Balch endowment for the farm and program. He was also inducted into the Vermont Agricultural Hall of Fame in 2005. Dr. Balch touched many lives during his career and beyond. He was admired, loved and respected by those who knew him. Donald was predeceased by his beloved wife, Mary, in 1993. He is survived by his son, Brian and his wife Diantha of Waltham, VT, his daughter Brenda Charron and her husband Lee of New Haven, VT, his granddaughter Kristin Blier and her husband Kevin, of Brandon, VT, his grandson Kevin Charron and his wife Jamie of Barron, Wisconsin; five great-grandchildren, Aidan and Collin Blier, Mary Anna, Logan and Kolby Charron. He also leaves an older brother, Charles and his wife Mertie, niece Priscilla Power, nephew Russell Balch, all of Lyme, NH. Mary's nieces Ruth Allsop, Marie Ames and nephew Gerald Ames were also important in his life. Don loved his family and friends and will be greatly missed. We thank the team at the Medical Center Shepardson 4, Laura Nelson from "Home Instead", Dr. Peter Gunther and Rev. Kevin Goldenbogen for their compassionate care. We also thank Dave and Irene Kelly, Bill and Bev Frank, Tracy Wright, Roland Burroughs and all his caring and helpful friends. There will be a celebration of Don's life Wednesday, June 8th at 11:00am at the United Church of Underhill. In lieu of flowers, donations may be made in his name to the United Church of Underhill, 7 Park Street, Underhill, VT 05489 or the UVM Morgan Horse Farm, 74 Battell Drive, Weybridge, VT 05753.